There’s no debate about the power of storytelling. Stories persuade and inspire. They paint a compelling picture in the mind’s eye. They bring complex data to life. They build trust and understanding between storyteller and listener. The need for better business storytelling comes up in nearly every sales conversation we have with clients and prospects. In the classroom, most learners agree that stories are useful tools, but most of them also believe they’re not very good at storytelling. So, if everyone sees the benefit of stories, why aren’t we confident about telling them? My answer to that is simple. We’ve been led to believe that storytelling is complex and that only creative people can master the art of it. For example, we’ve been told that every story needs a hero, a villain, supporting characters, conflict, rising action, and a climax. All of that can be confusing and daunting. While it’s necessary for fiction authors, playwrights, and screenwriters, those traditional storytelling elements are not necessary for business people. Several months ago, my colleague, Dale Ludwig, and I were leading a communication workshop to help experienced trainers be more effective in the classroom. The client was a major healthcare alliance in the Midwest. During a dry run, one of the attendees, Carol, was struggling through some dull change management content. She was having a tough time making the content interesting and relevant to an audience of senior leaders at the organization. What was surprising about this is that Carol comes across as an incredible trainer. When she walks into a room, people notice. It’s not just her fiery red hair. She has an air of confidence that few have. When she speaks, people listen. In the training room, she’s usually a force to be reckoned with, but with this content, she struggled. As she spoke, it was clear that I had touched a nerve with her. Her gestures grew, and so did her facial expressions. Her speaking pace quickened, and her volume raised. The point to my story is that we tell stories all the time. We may not think of them as stories, but they are. We complain about the traffic and that driver on his phone. We share what the kids are up to and who we ran into at the grocery store. The only difference between those stories and stories told in a business setting is intent. Business stories are more than small talk; they are crafted and told with a goal in mind. The goal of my story about Carol was that I believe everyone can tell stories. We just don’t realize it because we do it all the time. We’re like fish who don’t see the water we’re in. So, What Does This Mean for Business Storytellers? It means that you need a new way of thinking about the stories you tell. You need to let go of the complexities of protagonists and antagonists—of rising action, climax, and denouement—and replace them with something much simpler. The first part of the definition simply involves a shift in time and place, something that happened in the past or something that might happen in the future. 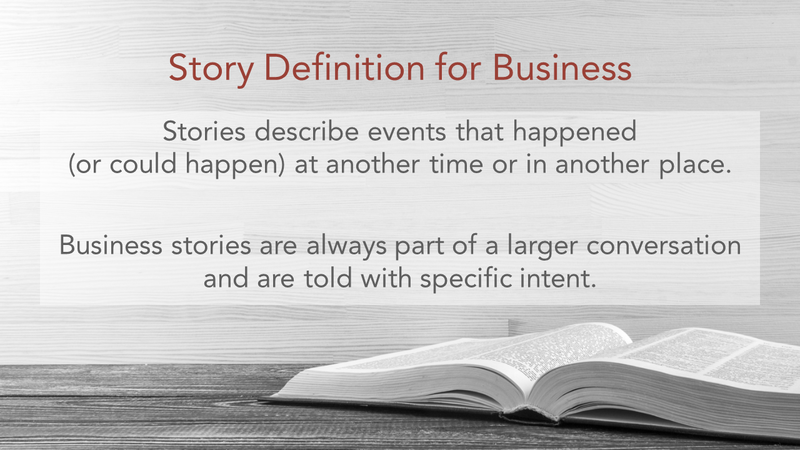 The second part of this definition points to the difference between everyday stories among friends and stories told for business purposes. These stories exist within conversations already taking place and are told with intent. Salespeople tell stories during sales meetings to close the sale. A manager tells a story about how the new process will make life easier for her direct reports. Tenured employees tell stories to new hires during onboarding to help them understand how work gets done. CEOs tell visionary stories that are intended to paint a picture of the ideal future. No matter what a business story is about, it should be told to reach a specific goal. What follows is an example of how we recommend crafting a good story. The left column contains instructions. In the right column, I deconstruct my story about Carol so that you can see how this works. What are you trying to achieve with this story? To explain that everyone can and does tell stories. These elements are the facts of the story and are made up of the five Ws. These elements provide commentary and texture to the story. These elements can be dialed up or down, summarized or elaborated on during the telling of the story. Including these elements can make the telling of the story more compelling, persuasive, and memorable. As you craft your business stories, think about how to make each story come to life by dialing up or down the various elements. When telling the story, make the elements in the story feel real and relevant. Be concise, but not so brief that the story doesn’t come to life. I tell Carol’s story often during our workshops, and it’s never the same twice. However, one time I left out the detail about her fiery red hair. The story didn’t have the same impact, so that element was put back in. There’s something about that image that brings the story to life. To wrap things up, don’t be afraid of telling stories. You tell stories all the time. What’s important in the business setting is that you tell your stories with intent and make them relevant to the conversation taking place.